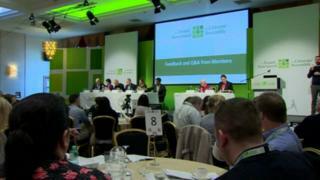 The first Citizens' Assembly for Northern Ireland is to go ahead next month, it has been confirmed. Funding for the group was first made available in January. It will meet over two weekends, starting at the end of October. The body will be made up of people selected at random by different methods, reflecting the make-up of Northern Ireland society. Its first debate will be about Northern Ireland's adult social care system. The group, made up of between 50 and 100 people, will run like the assembly that currently operates in the Republic of Ireland. It was tasked by the Dáil (Irish parliament) to make recommendations on a number of issues including climate change, referendums, and fixed-term parliaments, as well as abortion. The job of assembly members is to debate and discuss political and constitutional issues and come up with conclusions. The NI Citizens' Assembly will meet in Belfast on 26-28 October and 16-18 November. Funding for the Northern Ireland operation has been made available by Building Change Trust, which supports and invests in the voluntary and community sectors in Northern Ireland. The Building Change Trust offered £100,000 to Involve - a charitable think-tank - to run the Northern Ireland operation. Over the two weekends, the members will look at the public's views on a social care system fit for the future, including the role that the health service, communities and individuals need to play. But any conclusions the group reaches on the issue will not be enforceable. The Citizens' Assembly currently has no legislative or statutory decision-making powers, and will operate in a purely advisory capacity. Tim Hughes, director of Involve, said that too often, decisions affecting the lives of people in Northern Ireland were being taken without them. "The Citizens' Assembly for Northern Ireland will demonstrate the role members of the public can play in helping to tackle the challenges that face us," he added. "We hope that its success will lead politicians to adopt the model to address further issues in the future." The advisory group behind the assembly includes lecturers from Queen's University and Ulster University, as well as Lynn Carvill from Women's Tec, an organisation that encourages skills training for women. Ms Carvill said the Citizens' Assembly would "give ordinary people a real voice on the future of social care". "It's such a complex and emotive topic that the space for careful deliberation on the values we want our social care system to embody is badly needed," she added. This is not the first time that creating an assembly for debate has been tried in Northern Ireland. Back in 2000, a Civic Forum was set up under the Good Friday Agreement, with people appointed from different sectors of society. However, this new assembly will be different in that members have been selected at random, rather like selecting a jury, and the entire group will be representative of society. Some of the political parties at Stormont, including the Greens, have been calling for such a group to be created, but other parties said citizens' assemblies were no substitute for democratically elected bodies and legislatures.